I have been following the horrible news about the wildfire up on Mt Hood since I visited Cloud Cap last weekend. During that visit, I photographed the very beginning of the visible smoke to this now out of control mess. This area has been victim to wildfire before, most recently only 2 or 3 years ago. 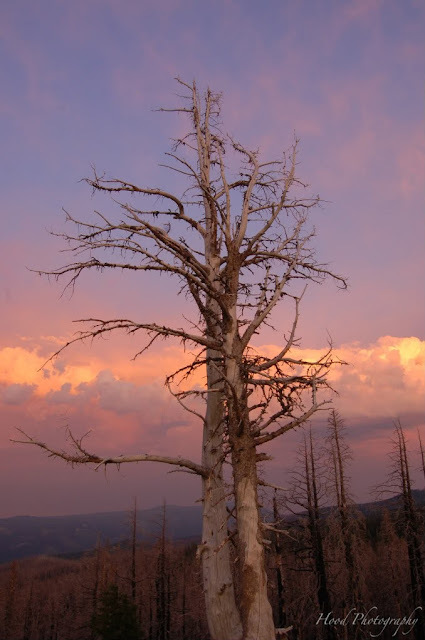 While I was up there, I also photographed this tree, with the previously burned forest behind it. The charred remains of the forest have not been cleaned up at all, which leaves an incredible amount of fuel for the fire to thrive off of. Still burning, The Dollar Lake Fire on Mt Hood has charred at least 4,500 acres. I've witnessed a small wildfire this year and it was frightening - how much more terrifying on such a grand scale. Yes, horrible news, tho the sky is oddly beautiful. So very sad but even this will once again renew itself. There has been so much destruction all over the country this year from weather, fires and floods and it is SO sad. I, too, know that nature will renew itself, but there has been so much more damage than usual. Terrific capture for the day and it does say it all! Take care! It's heartbreaking to watch our forests burn. And now this late summer heat wave adding fuel.. Your image is very dramatic and very beautiful. Oh yes, smoke always makes for pretty skies. This is a beautiful shot with a sinister truth behind it. I just found out from a childhood friend there is another such fire in BC's Okanagan Valley, near Kelowna where I grew up. Heartbreaking. These wildfires break my heart. Every time we visit the SW, we encounter at least one big one running rampant. I love Oregon's greenery and this is a tough one to swallow. Was this fire caused by some stupid camper and their campfire or by lightning? I love your photo of the dead tree like two lovers locked in an embrace even in death. Forest fires are the bane of our life here in Australia as well and we are heading into a summer with a 28 year build up of fuel. We lost all we had in the last one, including our historic house and 3 acre garden. Worse still is the fact that most fires are started either by arsonists or adjuncts to civilisation like sparks from power lone clapping together when the lines expand in the summer heat, or the use of welders, grinders or tractor exhausts. I do hope this fire can be extinguished soon and that a downpour helps the firefighters. Haunting photo. Love how you captured the colors. Where I live in Texas, we are presently surrounded by wildfires. As of yesterday 500 homes had burned. As of today, 1,000! Despite the fire, this photo is beautiful. My ABC is about the only http://www.meetourclan.com/2011/09/horse-ride.html I can tolerate. I'm sorry to hear about this destructive fire....we know about wild fires here in Southern California too. Your photo is very dramatic and beautiful. We were up there that weekend to and noticed the smoke as we hiked towards Cooper Spur from Cloud Cap. I did notice all the dead wood around the area... lots of kindling. It drives a fire fighter friend of mine crazy that the beetle kill forests and old burns aren't cleaned up at all... just a tinder box. The thunder/lightening was terrible on the previous Thursday night/early Friday morning... practically shook us out of bed! Nature is an awesome force.